From 24 to 27 May, Sedition presents a screening programme as part of the Athens Digital Arts Festival. Post Human Futures at the Megaron Athens Concert Hall featuring 13 works by Sedition artists curated by Sedition’s Head of Programmes, Ashley Lee Wong. The works in the programme respond to the influence of computation on decision-making, thought, architecture, biology. At a time when computation is re-shaping practically every form of thought, humanity as a concept is fundamentally challenged. Algorithms are no longer human innovations but powerful decision-making agents. Post-Human Futures explore the possible futures that could arise within our universe under these conditions, with technology and science beyond human capacities and human influence reduced as decisions are deferred to machines and artificial life. New futures and realities begin to emerge beyond the human imagination that are abstract and uncanny versions of our technological and natural worlds. The works in the screening programme deal with such topics as artificial intelligence and quantum theory; these complex topics are explored through generative visuals, digital landscapes and virtual environments. Artists featured in the programme include: Ryoichi Kurokawa, Joëlle, Matteo Zamagni , Yoshi Sodeoka, Eva Papamargariti, Maxim Zhestkov, Frederik De Wilde, Nicolas Sassoon & Rick Silva, LIA , Andreas Nicolas Fischer, Markos R. Kay, and Eric Schockmel. New works by Frederik De Wilde and Andrew Thomas Huang are being launched on Sedition alongside the screening. SoN01R by Frederik De Wilde is a work created in collaboration with Frederik Vanhoutte and is being launched on Sedition alongside ADAF. The work is an artistic visualisation and sonification of quantum fluctuations. Using real-time data from the Australian National University, Department of Quantum Science led by Dr. Thomas Seymul, the artists tap into a physical quantum source that can generate true random numbers. SoN01R shows that it is possible to generate something out of (almost) nothing in the quantum vacuum to create an impressive audiovisual work. Flesh Nest by Andrew Thomas Huang is a nine-part sci-fi video series illustrating a post-apocalyptic digital multiverse, presented here as a single-channel video. Five editions of the series are launching on Sedition as part of the programme. In Flesh Nest, Huang conceives of the digital afterlife as a depiction of the internet as a weird and mythical landscape. Like a Hieronymus Bosch painting, the work features a multiplicity of characters and edifices that build up and crumble down in a hellish scrolling tapestry. Taking over a year to complete, the work was created in collaboration with motion capture technology company Noitom, choreographer Nina McNeely and fashion designer Ashley Eva Brock. Terms & Conditions Apply by Matteo Zamagni is a video work derived from the interactive real-time installation of the same name. The concept for Terms & Conditions Apply is a metaphor for the 'Anthropocene', a term that marks a new era whereby the human species triggers a permanent shift in the ecosystem, the natural world and its evolutionary processes. This project was born from a need to call to attention to the burden of the humans onto Nature. The disconnect of our species from the natural world marks the beginning of a destructive process that in turn has consequences for our existence. Yoshi Sodeoka’s video work Of Soil (2017) explores the relationship between patterns in nature and infinity. In his practice, Sodeoka has repeatedly examined the point at which the complexity of nature fends off and suggests infinity and chaos. The piece is composed of photographic fragments and geometric elements arranged into complex patterns resulting in a trance-like, kaleidoscopic play of shadow and light. Using digital effects software, Sodeoka produced Of Soil by manipulating still and moving images with various combinations of filters to imitate natural optics. The soundtrack was created by Sodeoka’s long-time collaborator, MYMK. Elements is an experimental video work by Maxim Zhestkov, which explores nature, physics, art and love through digitally animated particles or ‘elements’. More than two billion particles, governed by tensions and forces influenced by those occurring in nature were used to replicate the motion of collective behaviour. As well as patterns of motion, the particles tell stories and evince emotional responses. The work demonstrates that there is a relationship between the tiny and individual, and the enormous and multiple. The ideas the work explores brings together emotions, behaviours, thought processes, relationships, life, planets and the universe. Signals is a collaborative project by Nicolas Sassoon and Rick Silva. Sassoon and Silva share an on-going interest in the depiction and alteration of natural forms through computer technology. The project focuses primarily on immersive audiovisual renderings of seascape environments and draws from scientific oceanic surveys, virtual reality and natural phenomena to generate video works, prints, sculptures and installations that reflect on environmental inquiries, concepts of monumentality, and alteration. Signals 4 is the fourth work of the series presented as a 3D animation of an oceanic landscape. For the animated video work Further, LIA has created an environment of blackness through which abstract forms interact. The algorithmically generated image constantly surges forward, producing endless new configurations of shapes. The energy and complexity of the interacting forms leads the viewer’s imagination in diverse directions – a Joan Miró painting and a microbe can exist at the same moment in the same digital space. This multiplicity of possibilities begins with two simple structures – a circle and a curved line. LIA’s computer-generated images in turn interact with a soundtrack by Damian Stewart. Andreas Nicolas Fischer’s Computer Visions II is a video work featuring a computer-generated voice staged as a kind of psychotherapeutic session. 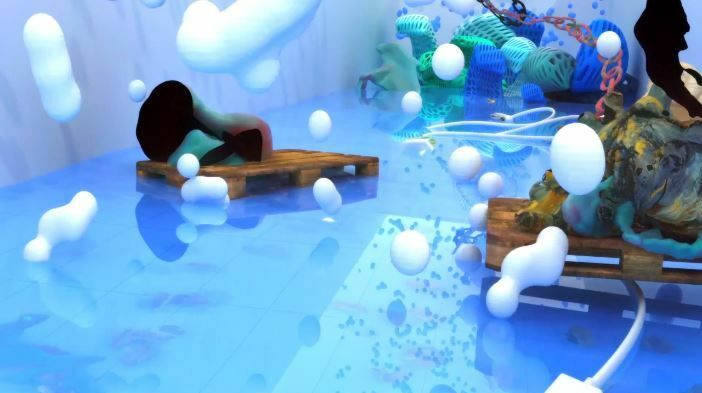 In the work, Fischer brings together surreal 3D animated images as a dreamscape drawing from mythology, and an AI voice that asks questions about life and anxiety in a future world where people live over 125 years. Immersed in a virtual reality, the voice is uncanny in its imitation of human tone, language and inflection. It tells of a time in the future when our interactions and realities are dictated by machines that aid us in our daily lives. Created as a series of virtual experiments, Quantum Fluctuations by Markos R Kay shows the complexity and transient nature of the quantum world, which is impossible to observe directly. In Quantum Fluctuations, particle simulations are used as the brush and paint to create abstract moving paintings that visualise the events that happen during a proton collision. These visualisations were created with input from scientists working on the Large Hadron Collider at the CERN, Geneva. By using computer simulations as an artistic tool, this conceptual reimagining of quantum theory aims to challenge our ideas of how scientific observation and knowledge are formed. Eric Schockmel’s The Feathered Serpent is a 3D animation from the What If You Created Artificial Life And It Started Worshipping You series. The works seeks to address the technological singularity as an effect of artificial intelligence, as discussed by historian Henry Adams. Delivering art as science fiction, Schockmel’s work demonstrates that there is an elemental energy that furnishes all life. Schockmel’s video game aesthetic envisions a future in which technology becomes sophisticated enough to allow for the birth of automated organisms that themselves evolve sentience, and subsequently start to worship their creators. Turmoil is an audiovisual work by Joëlle with a soundtrack by electronic artist Killawatt. The work explores the themes of fragility and desolation. In Turmoil a thick, vast, rolling digitally rendered landform moves powerfully and consistently, yet seems likely at any moment to combust, flatten and disperse to nothing. The accompanying soundtrack emphasises the fragile and unsettling equilibrium between order and chaos created by the visuals. Image and sound come together to produce a work which sits at the junction of different renderings of the real, referencing both the ocean wave and the algorithm. unfold.alt (2016) by Ryoichi Kurokawa is a single-channel version of unfold, a work originally developed as an audiovisual installation. unfold renders observations of the star in various wavelengths in the Galaxy such as the Vela, and simulation data like gravitational collapse, supernova are translated into human scale audible/visible/tangible phenomena. The work creates an immersive audiovisual synesthetic experience. The scientific truth is temporally/spatially compressed into a cosmic phenomenon as a perceptible 3D audiovisual composition. Simulation and observation data from stellar formations are translated into audiovisual phenomena and create a different time design. Eva Papamargariti’s video work Prosomiosis (see top image) comprises 3D rendered animated scenes. Prosomiosis is the Greek word for simulation; the term refers to the simulation of reality and its phenomena. In creating the work, Papamargariti attempts to create a fictitious digital environment inspired by geometries and patterns that can be found in the natural world. These natural geometries and forms are re-constructed and represented as fragments of a virtual ecosystem that could be extracted from the world of dreams and imagination.